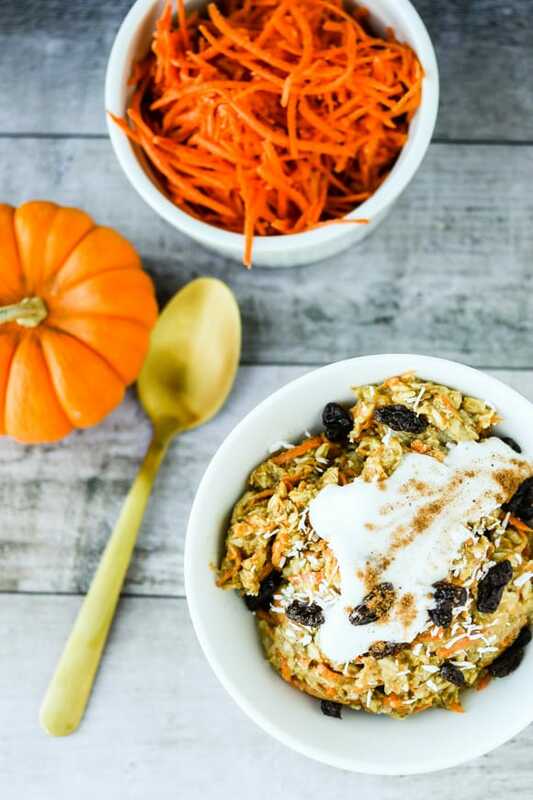 This Healthy Carrot Cake Oatmeal is both gluten-free and dairy-free, and includes a serving of veggies. 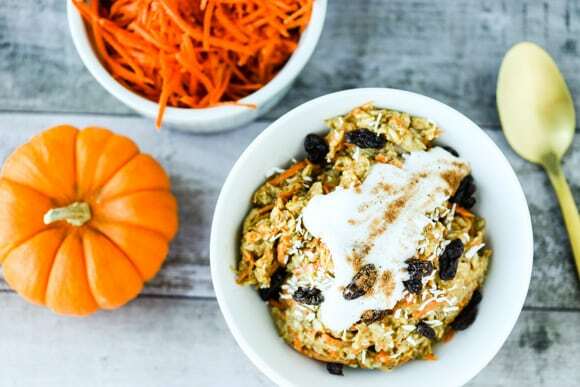 Don’t be fooled by the vegetables though, this hearty Carrot Cake Oatmeal breakfast dish is delicious and tastes like dessert. Now that it’s finally cooled off after that crazy heat wave we had for seemingly forever, it’s quite cold AND dark in the mornings. I still make green smoothies and then shiver for an hour, but I also like to make a hot breakfast a few mornings a week as well. 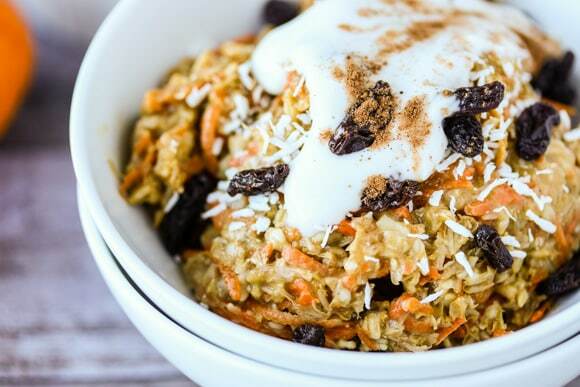 Carrot Cake Oatmeal for the win! 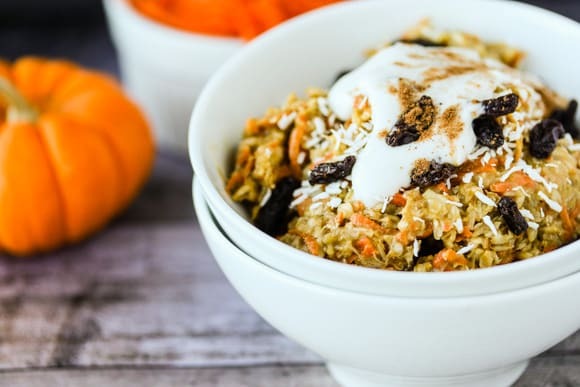 This is an easy twist on oatmeal, and you’ll see I included finely-shredded carrots to make it healthy, I mean to make it taste like a carrot cake! I even marked this one in the category of kid-friendly recipes since my husband said he liked it and didn’t complain about the carrots, ha ha. You can see how much great texture this oatmeal has. BTW, if you like the sound of this recipe, you might also like my Zucchini Bread Oatmeal, Cinnamon Roll Buckwheat Porridge, or my Gingerbread Chia Pudding too! You’ll see in the recipe instructions that I like to pre-soak my oats before cooking to make them easier to digest and less stressful on the gut. It’s an easy step, but it’s totally optional and doesn’t change the cooking time. A fun twist on oatmeal! Combine the oats, carrots, and almond milk in a medium-sized saucepan. Place over medium heat and bring the mixture to boil. Stir in the pumpkin pie spice and raisins and reduce the heat to low. Cook the oatmeal for about 6-7 minutes total, or until the oatmeal has thickened. Stir in the collagen protein or your favorite protein powder and the coconut butter, and serve hot. I like to serve mine with a drizzle of dairy-free yogurt for extra creaminess! *I like to soak my oats overnight in filtered water and a bit of apple cider vinegar. Then, when I’m ready to cook the oats, I rinse them well in a strainer before adding them to my saucepan. This helps improve the digestibility of the oats. It’s an optional step for this recipe. Looks divine! Addition of carrots is genius! This is such a fun change up to oatmeal day! My girls have oats every Monday – I’ll try this next week! What a superb breakfast! I love it! 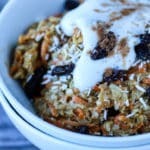 Carrot cake oatmeal?!!! Sign me up! I love all things carrot cake and this sounds so comforting and delicious. Carrot cake is my faaaavorite, so I know I’ll love this oatmeal! Such a cozy comforting breakfast. This is my type of breakfast. I’ve been trying to get in veggies at breakfast, and this oatmeal is perfect! That’s great to hear, Tina! Thanks for the nice note. XO. Oh I love how this looks!!! Love that coconut butter and collagen, too! Yum and thanks for such a fun variation on oatmeal!! You’re so welcome, Megan! Thanks for the sweet note. XO. What a great breakfast idea! I get so tired of regular oatmeal, so this would be a welcome change! I’m so glad you think so, Vanessa! I love adding veggies to my oats, and carrots work really well for that. XO! Great way to get some veggies in at breakfast! Looks delicious! I love oatmeal but this is next level!! Yum!! I am all over that pumpkin pie spice and carrots!! I love the added vegetables in oatmeal! The pumpkin pie spice is perfect for this time of the year. This looks amazing! Oatmeal is my go-to breakfast, and carrot cake is one of my favourites….so looking forward to trying this and so glad to have found your blog! I had a bad experience with carrot cake oats awhile back- I’ll have to try your version instead! It sounds like such a fabulous idea– I want veggies with my breakfast! Give it a try and LMK, Sarah!!! This is the perfect portion – when I get a craving for carrot cake, I never want to make a WHOLE cake. This would quell that craving perfectly! What a unique idea to add carrot cake flavors to oatmeal! This will definitely liven up our breakfast routine. Love that it’s made with cashew milk, too! Oooh, I LOVE oatmeal and I’m so intrigued by this delicious version you’ve made! I’m going to have to try this out! Carrot cake, yum! This sounds so cozy, and I love that you added collagen in there, I’m always putting it my foods and drinks as well. Seriously? I can have carrot cake for breakfast? Love this–carrot cake has always been one of my favorites! Fun breakfast for guests, too! I eat a fair amount of oatmeal but have never seen a carrot cake version before – I love this idea! Thanks for sharing, I will definitely add it to my breakfast rotation. Yummy! This is such a good idea. I love carrot cake, so why not eat a healthy version for breakfast?! SO GOOD! This sounds like the perfect combination of dessert and breakfast! We (ok, maybe just I) eat a lot of oatmeal around here, can’t wait to give this a go. I love the shredded carrots in this! I think I need to start putting them in my oatmeal every time!